It’s a brand-new edition of the Big 5 Daily! Excited? Big News! Facebook is working hand in hand with non-profit research partners on ways with which Artificial intelligence (AI) can tackle massive health and infrastructural challenges in Sub-Saharan Africa. This includes sorting rural electrification and vaccinating people in Tanzania and Malawi. Facebook is leveraging on its technological prowess, extensive data science skills, expertise in AI and machine learning to roll out a detailed and accurate map of local populations. Moving on, Jumia, the largest e-commerce operator in Africa has postponed its initial public offering launch. It has been confirmed that the IPO, initially slated for Thursday 11th has now been postponed to Friday 12th. The company moved the IPO because they wanted to update the market with some numbers for its first quarter of 2019. 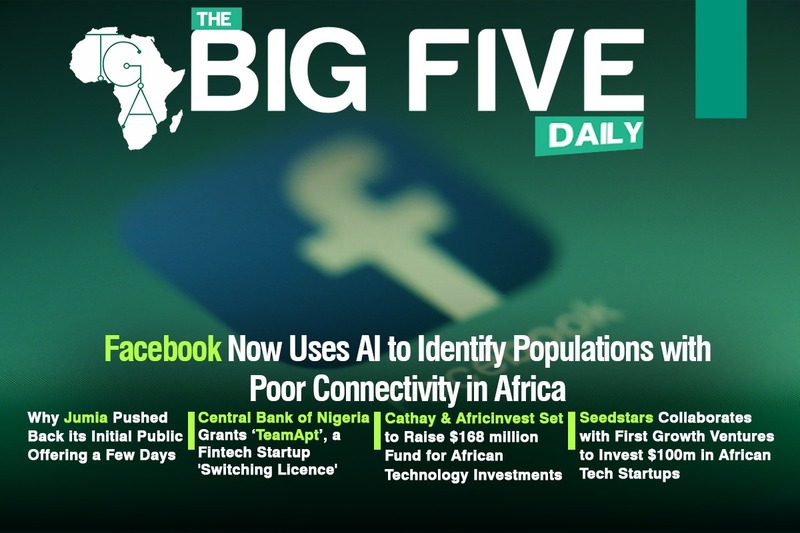 Next on the Big 5, Nigerian fintech startup ‘TeamApt’ who recently secured a $5.5 million funding has also secured a switching license from the Central Bank of Nigeria. This announcement was made on the company’s social media page. The startup will leverage on the license to switch money between banks by debiting them upon customer request. This license will power ‘AptPay’ one of TeamApts products. Seedstars also announced that it would launch a $100 million fund to invest in African startups in collaboration with Paris-based, First Growth Ventures. The fund accounts for the first of a series of regional funds Seedstars will launch in the coming years to continue its mission of accelerating and supporting entrepreneurs at all stages. Finally, Paris-based private equity firm, Cathay Innovation and Tunisian based private equity firm, AfricInvest plans to raise $168M fund for technology investments in Africa. This new fund is the largest venture capital fund in Africa with nine offices interconnecting the entire African continent. The aim of the fund is to incite change in the financing and development of startups in Africa by providing the right funding for the creation of new digital infrastructures and services.